Commentary from Chris Brummer here. Economic diplomacy is changing. The multilateral organizations that dominated the last half of the twentieth century no longer monopolize economic affairs. Instead, countries are resorting to more modest "minilateral" strategies like trade alliances, informal "soft law" agreements, and financial engineering to manage the global economy. Like traditional modes of economic statecraft, these tools are aimed at both liberalizing and supervising international financial policy in a world of diverse national interests. But unlike before, they are specifically tailored to navigating a post-American (and post-Western) world where economic power is more diffuse than ever before. This book explains how these strategies work and reveals how this new diplomatic toolbox will reshape how countries do business with one another for decades to come. Chris Brummer's core message is that multilateralism is giving way to minilateralism. As the era of American hegemony draws to a close and as the institutions that once dominated the multilateral era (the WTO, the World Bank and the IMF) find themselves constrained by a more complex environment, new institutions and smaller networks are developing, much as the first small, furry mammals quietly appeared at the end of the Age of Dinosaurs. 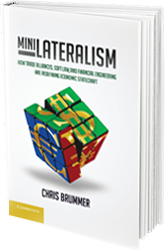 Chris Brummer has brought several seemingly disparate trends in the global financial system together under the useful umbrella of minilateralism. In doing so, his lively and engaging writing style gives life to the details of global governance and financial engineering. Most importantly, however, instead of just celebrating the new status quo, he identifies minilateralism as a response to globalization that when improperly managed can create as many problems as it solves. Professor Brummer ably captures the recent evolution from standard-setting and consensus building via large, multilateral institutions promoting universalist principles, to norms established via smaller coalitions focused on addressing the particularist needs of like-minded partners. Few books tackle so many topics so clearly and elegantly, and bundle them into one compelling narrative. Moving from the regulation of coins in medieval Europe to today's international money supply and the rise of the Chinese RMB, and from Venetian trade strategy to today's WTO, Minilateralism offers a compelling history and theory of how economic diplomacy works. For standard-setters looking to understand their role in the global economy, a must read from a top expert in the field.